A player from Christianburg / Wismar attempts to dribble past two New Silver City defenders in their clash yesterday at Wisburg ground. 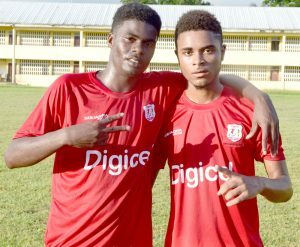 Christianburg / Wismar goalscorers Brian Johnson (left) and Shaquille Campbell pose for a photo op yesterday. Displaying the tenacity of champions, Christianburg / Wismar rebounded from a dismal first half performance to escape with a 2-0 win over a determined New Silver City Secoindary to advance to the final of the Region 10 Zone of this year’s Digicel Schools Football Championship. The encounter, which was played yesterday at the Wisburg ground, saw the champs squander numerous chances in the opening period, before netting two goals, one of which has to be ranked as one of the best so far in the competition courtesy of a flying header by Shaquille Campbell in the 63rd minute, before Brian Johnson scored in similar fashion from a goal mouth melee two minutes later to seal the victory and set up a mouth watering clash against a formidable Kwakwani side. The first period saw both teams’ waste early chances with the defending champions failing to take the lead after the usually reliable Omar Brewley missed from the penalty spot with the opposition goalkeeper bringing off a brilliant save to parry the ball on to the crossbar, before it rebounded into tounch for a corner. Shortly after, New Silver City had two cherries to bite on but on both occasions poor finishing kept the contest scoreless as players in one on one situations fired tame shots straight at the goalkeeper. The half came with no team managing to get on the scoresheet and the fair-sized crowd knew the second period had to be explosive and it was. First Christianburg / Wismar came out in attacking mode and went near on a few occasions with Brewley and Johnson firing just outside the uprights. Substitutions by the reigning title holders were the answer with Campbell very early showing the kind of desire as one of the newcomers to the team. He sprinted on to a cross from the left side and with the proper impulsion delivered a bullet-like header into the right corner to give his side the lead. Bouyed by their initial success and ozzing with confidence, it was another substitute that gave them the cushion they searched for in Johnson, who leaped high in the air to head home a high bouncing ball in the goal area to make it 2-0. After that it was smooth sailing for the champs and they coasted to the end of regulation to set up a date with Kwakwani on July 4.